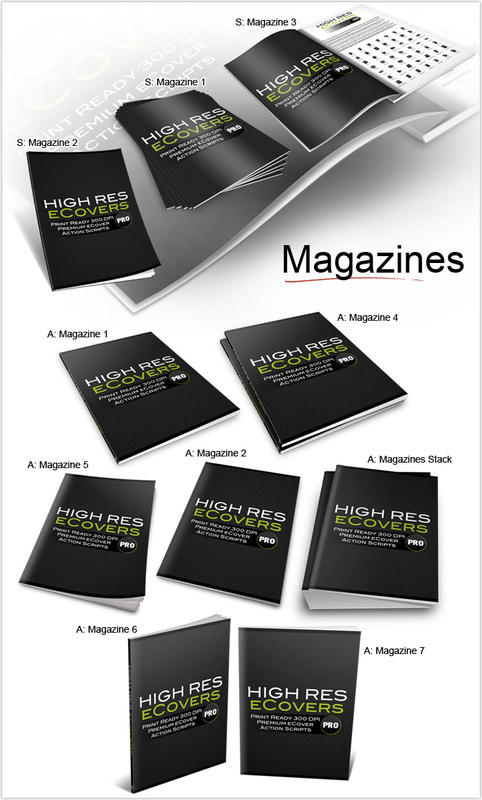 Do you want to give your info products an instant makeover? 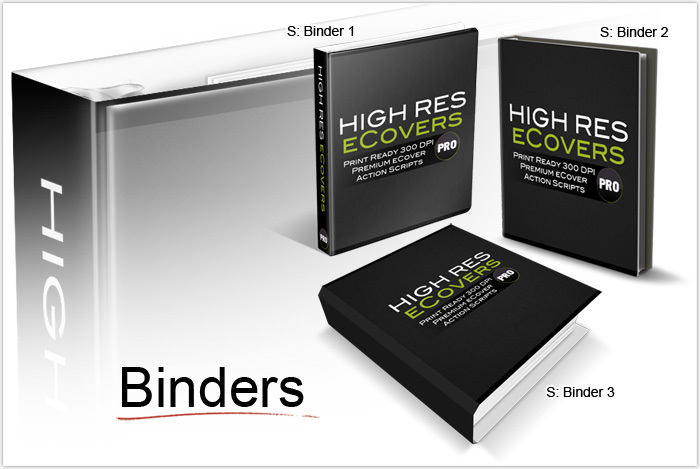 This brand new set of premium quality eCover action scripts and smart templates will help you do just that. And the best part is, you don't have to be a "techy" person or have any design skills at all. These brand new action scripts and smart objects will do the job for you. All you need is Adobe Photoshop and a few minutes of free time. real proof of making $7,645 in 1 month! This package consists of Photoshop action scripts and smart templates. If this sounds a little too technical for you, don't worry - these things are REALLY easy to use. 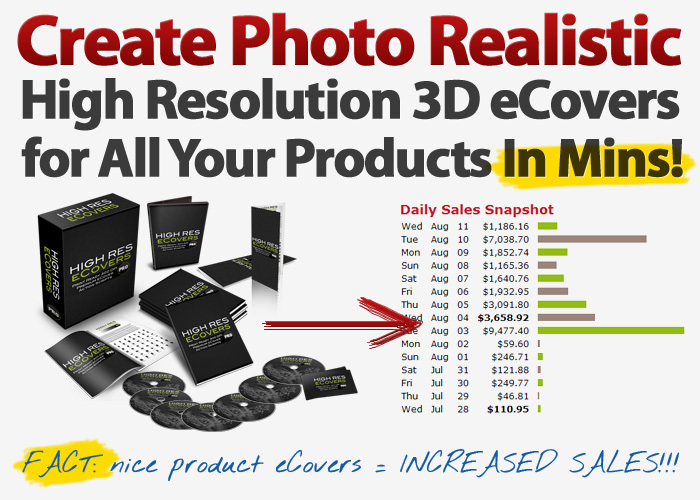 As long as you have Adobe Photoshop you'll be able to create killer 3D eCovers in just a few minutes. Don't Have Photoshop ... or Can't Afford it? Don't Worry ... See my Quick Tip Below On How to Get it SUPER Cheap! TIP: If you don't have Photoshop ... I've seen very inexpensive earlier versions of Photoshop on eBay and Amazon! In fact, I've seen Photoshop CS3 for only $49 on eBay! ... that's much better than paying the full price of $699! Plus, another trick to get the current version much cheaper .. simply buy an earlier version from eBay as I mentioned above, then simply use the upgrade feature on the Adobe website to upgrade to the current version. The upgrade is usually 70% less than the full price! * The Smart Templates require Adobe Photoshop CS4 or CS5, while the action scripts require Adobe Photoshop CS2, CS3, CS4, or CS5. Works on Microsoft Windows or Apple Mac OSX. Action Scripts are basically a recording of steps you take in Photoshop to create a certain effect. So if there are certain tasks that you always do in Photoshop, you can record your steps and save them into an action script. And you can later play back all of the steps that you recorded by simply playing the action script. In this case, I've recorded the steps I took to turn 2D covers into 3D covers. So all of the distort, resize, and other commands got recorded and can be played back with just a few clicks, and turn a 2D cover into 3D in seconds. So basically, you start with a blank template or a "starter template. You then create your own design. And finally you play the eCover action of your choice and the cover turns into 3D right before your eyes. Smart Templates are even easier and faster to use than action scripts. Just like action scripts, these smart objects also remember the steps you took to modify a PSD file - only instead of saving this information in a form of an action script, all these steps get saved as a "smart object". 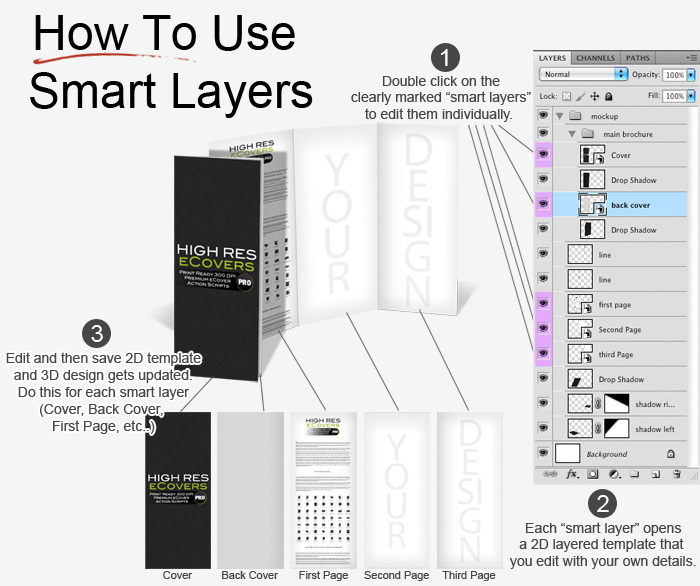 All you have to do is double click on the "smart layer", edit it as you like, then when you save it all the saved effects will get applied to this new saved smart layer. Each action takes under 20 seconds to render into 3D and the smart templates are even faster. That means you can modify and tweak your covers much faster. 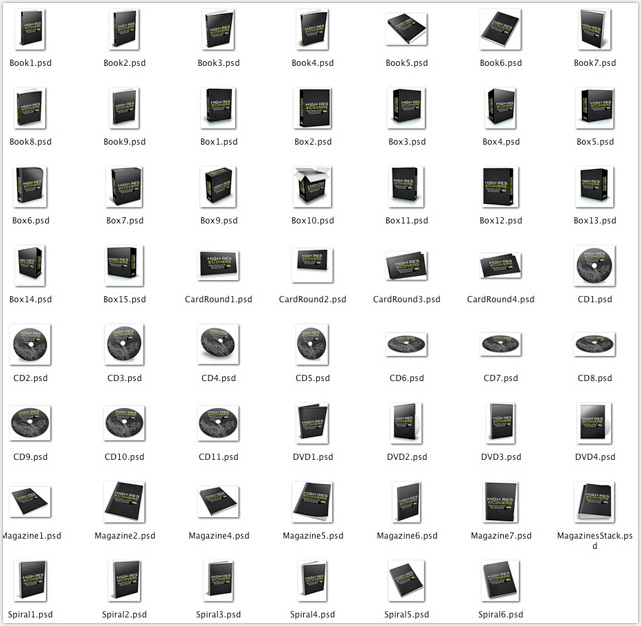 All the action scripts and smart templates are in high resolution ready to be used for print. There are no jagged edges or pixelation. Even if you already have another set of actions or smart templates, you won't find eCover types like these anywhere else. 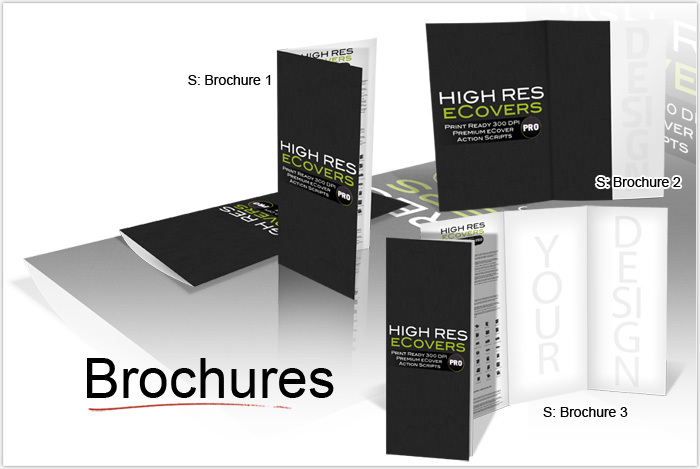 Great care went into creating each eCover action script and smart template in this package. Each one is premium quality and as good or better than anything else out there on market. 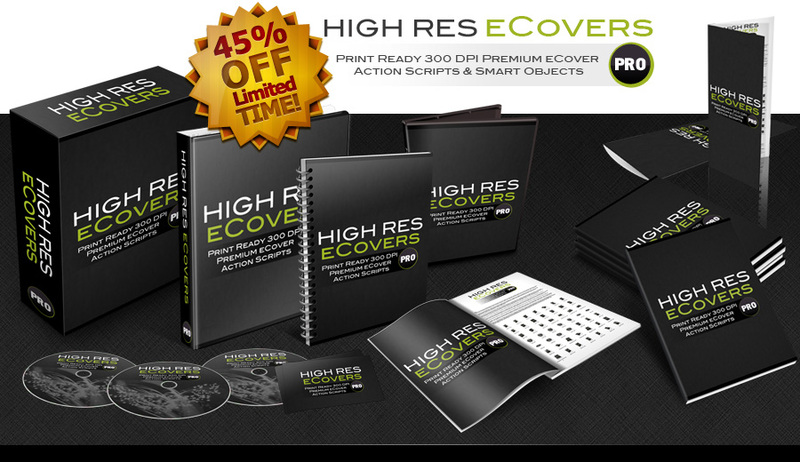 There are over 70 action scripts and smart templates in this package so pretty much all eCover types are covered and there's plenty of variety to choose from. 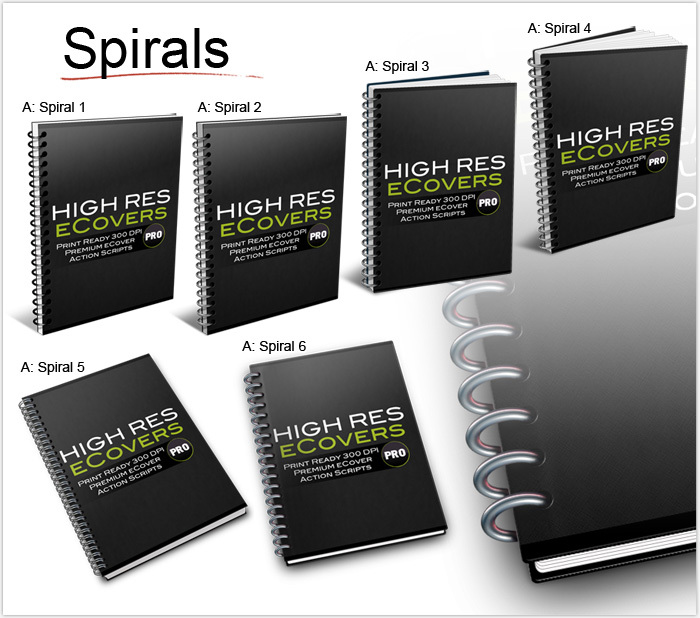 These are all brand new actions and smart templates created in 2011, so you'll be getting the newest and freshest "looks" for your products. You get 19 high resolution Smart Templates. 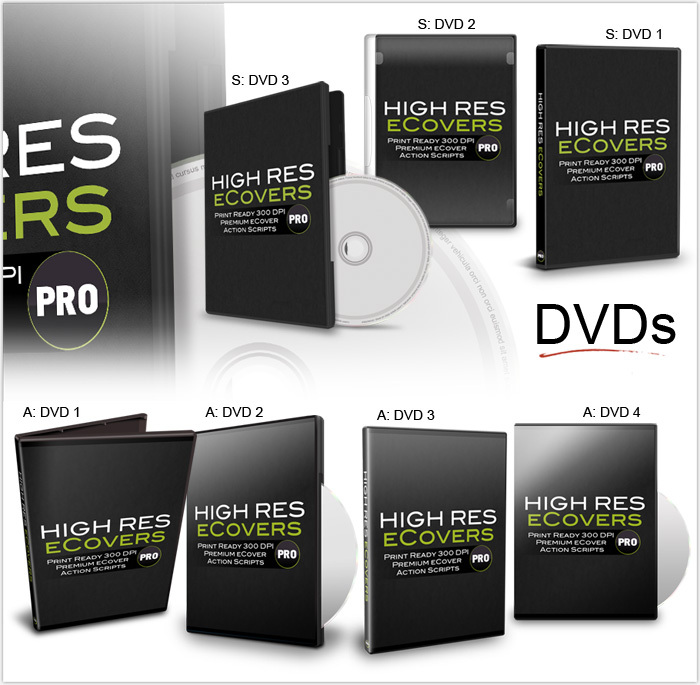 You get 55 high resolution action scripts for 55 different eCovers. This product is really simple to use, and literally takes just a few minutes to get started. But you still get simple step-by-step video instructions to be up and running right away. To make it easier to know which action script or which smart template creates which eCover, I put together a reference guide that has all the eCovers listed with the name of the action script or smart object next to them. 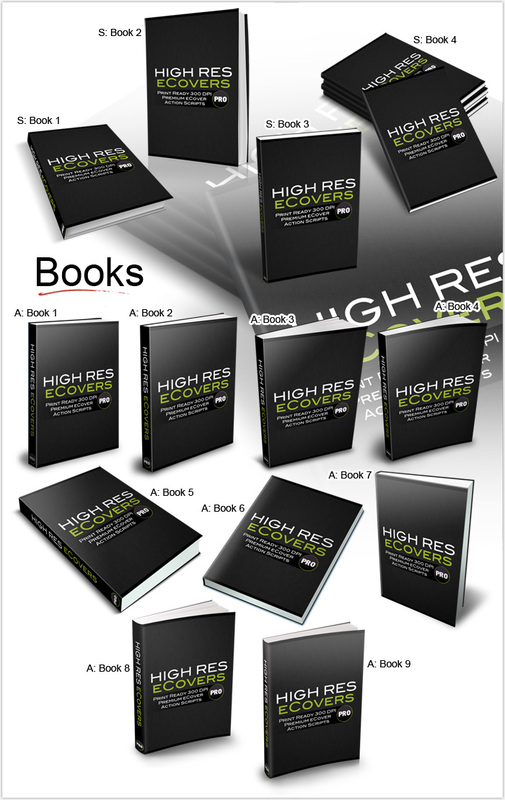 Your Private Label Rights for these PLR reports ... are ... completely UNRESTRICTED! Yes ... you can do absolutely ANYTHING you want with these reports. Sell them for a million bucks, or give them away for free! There are no restrictions. This is VERY rare and I won't be offering this anywhere else again. Your Private Label Rights for these articles ... are ... completely UNRESTRICTED! Yes ... you can do absolutely ANYTHING you want with these articles. Sell them for a million bucks, or give them away for free! There are no restrictions. This is VERY rare and I won't be offering this anywhere else again. The MD Graphics Package is a brand new innovative way to grab your reader's attention through beautifully smooth transitional animations! Plus, the animation technology is not flash ... it's performed using built-in jquery scripting ... but don't worry, you don't require to know any programming! Simply use Photoshop to edit the graphic type you want to use, save it, and then embed the graphic into your web page or blog. There is an easy-to-follow video guide that makes it super-simple to implement! Choose & edit 20 styled headlines with sub-headline that pops up after 3 seconds to increase effectiveness and capture the readers interest immediately! Choose & edit 20 styled ribbon areas which included a professionally styled ribbon graphic with headline and flashing text to attract readers. Choose & Edit 20 styled jQuery powered sliding boxes that are styled with HTML text included inside. Edit the text through simple .txt file! Choose & Edit 20 styled video boxes with your embeded videos and flashing graphics to increase the viewers of your videos easily! Choose & Edit 20 styled animated buy now boxes which include headline, icon graphics, timer and popup buy now button that can all be edited. Choose & Edit 25 HTML templates perfect for anyone needing a place to add your graphics to sell your products! Plus, the MD Graphics Package comes with a FULL resellers website where you can sell the Private Label Rights to your customers! So how much is this product? back to this site later and see the price has been increased back to $67, then sorry you missed out! System Requirements: The Smart Templates require Adobe Photoshop CS4 or CS5, while the action scripts require Adobe Photoshop CS2, CS3, CS4, or CS5. Works on Microsoft Windows or Apple Mac OSX. PS: Remember ... this special limited sale will end without notice! Take advantage of this limited sale before it expires! If you've been on my mailing list, then you know that I ALWAYS pull down my special discount offers just as promised! Get your copy now .. and don't miss out. I look forward to helping your online business grow. Click here to grab your copy now! 1. I don't have Photoshop, how can I get the software? You can simply get an older version of Photoshop at super low prices on eBay or Amazon. I've seen Photoshop CS3 for as low as $49 on eBay! 2. Is there another graphical software program I can use to run these action scripts? 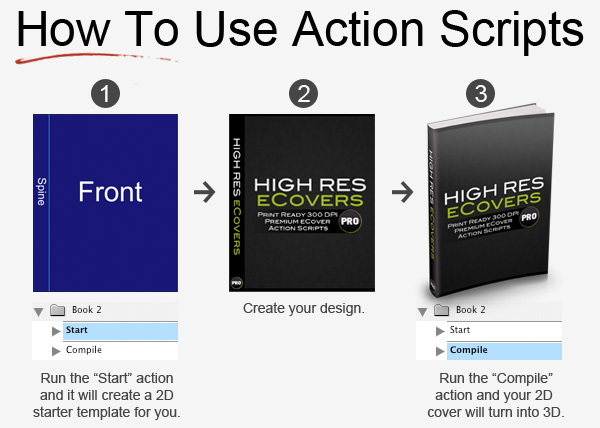 No, sorry but these action scripts will only work for Photoshop CS2, CS3, CS4, or CS5. They will also work on Microsoft Windows or Apple Mac OSX. 3. Is it possible to run these action scripts in Photoshop Elements? Unfortunately, the Photoshop Elements software cannot run these actions scripts. You must have Photoshop installed on your computer. As I mentioned near the top of this page .. you can find very inexpensive older versions of Photoshop on eBay or Amazon. 4. What exactly do you mean by "Ready to Print"? 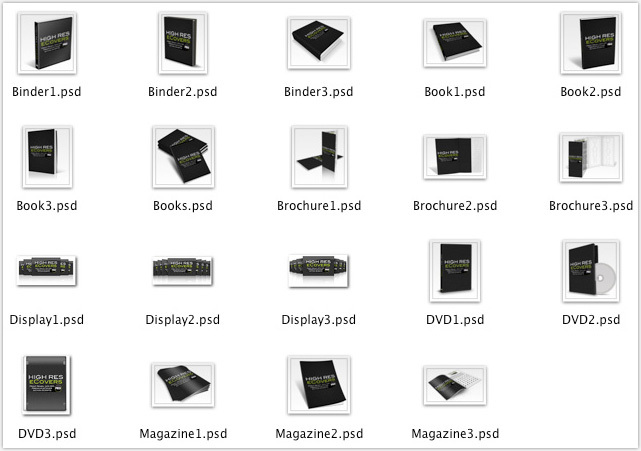 Does this mean I can print the graphics as well as use these graphics for online webpages? 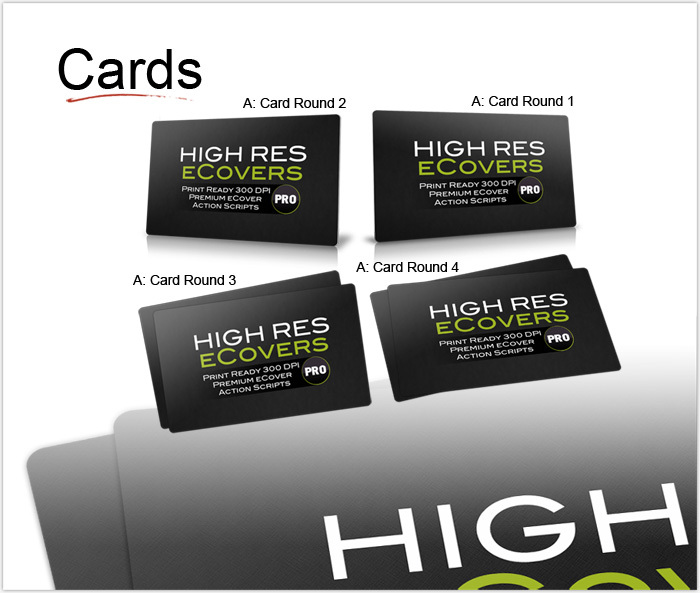 Yes, the eCovers are very high resolution which allows you to print very high quality images from your printer. 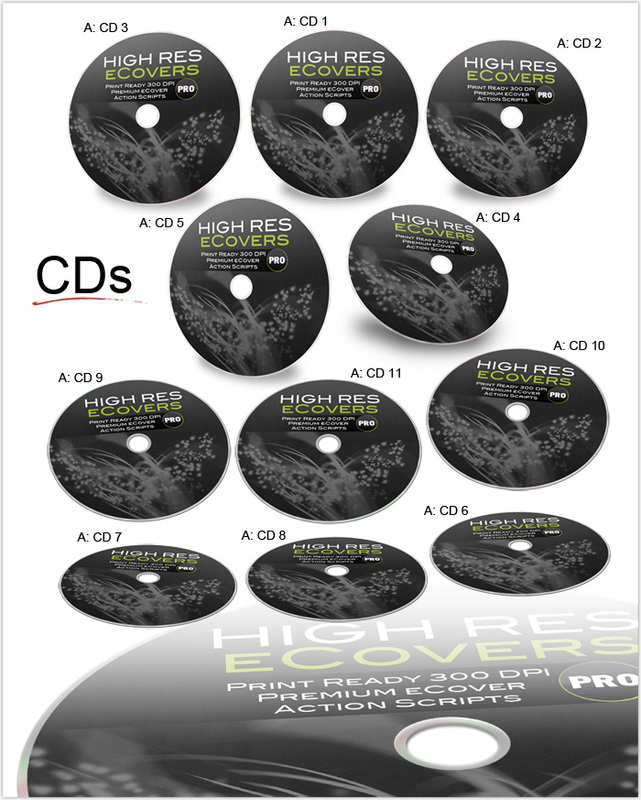 These eCovers can be used in offline marketing materials such as brochures, pamphlets, or printed letters. 3. Can these action scripts work in the older Photoshop version 7? Yes, The action scripts may work .. but the smart templates will not work. Copyright 2019 by Dave Guindon of InnAnTech Industries Inc. & iBiz Media Solutions. All rights reserved.